Ankur Kumar's Blog - Pragmatic Best Practices for Digital Architecture: Why In-memory computing plays an important role in Microservices Architecture? Why In-memory computing plays an important role in Microservices Architecture? The outer architectural building blocks are playing far more important role than the inner architecture of each microservice itself. I will be sharing my perspective on microservices' outer architectural building blocks (In-memory computing & caching, API Gateway, Containers, DevOps & Cloud Computing) in a series of upcoming blog posts. This blog post is focused on "in-memory computing technology", which plays an important role in microservices architecture. 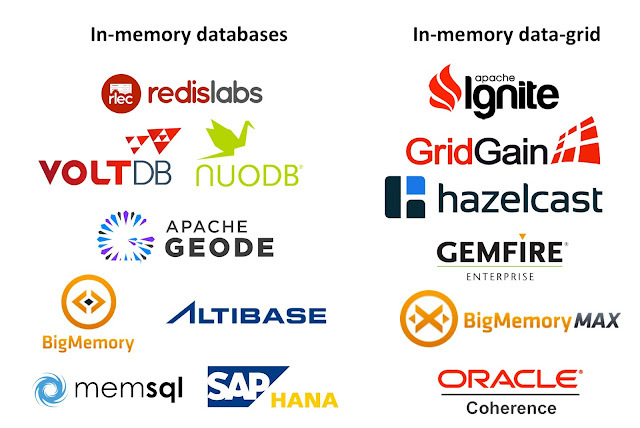 In-memory database - a database system primarily residing in memory (SQL or NOSQL). In-memory data grid - distributed computing based caching system usually having KV (key-value) storage. In-memory database plays a collaborative role in microservices architecture as usually it can be deployed independently and provides highly efficient storage support to microservices. Note that to sustain data stored in in-memory database during deployments, a backup approach with file-system based storage is required. In-memory data grid relies on distributed computing using clustering as underlying approach and provides a shared component (grid) for CRUD operations using memory. As microservices architecture recommends independent deployable units with minimal shared data, in-memory data grid is not completely aligned to this architectural approach. However, in-memory grid products can provide independent cache nodes to respective microservice with variation of distributed cluster to store backup data in the grid. Microservices architecture - It promotes independence and less dependency for linear scalability (cluster of instances of microservice but clustering at layer level is not recommended). In-memory data grid - It relies on cluster of nodes (data layer) for horizontal scalability (nodes can be added/removed on need basis for scalability). Because of the above reason, vendor like Oracle has started their cloud roadmap with less emphasis on Oracle Coherence for microservices architecture and more on cloud based offering for Cache-as-a-service, which can be easily integrated with microservices Architecture. However, this is also similar to common grid solution with variance that cloud is now playing the common grid. Also, In-memory grid solution is still relevant and playing its role behind the scenes (to support cloud's cache-as-a-service). Applicability: Primarily for inter-microservice communication, this pattern can be leveraged. Applicability: To store shared data such as backend system response (cached data), response data, content data, etc. To conclude, in-memory computing plays a significant role for Microservices architecture as an underlying storage mechanism for each microservice. Also, in-memory grid computing offers an alternative solution, which respects microservice's principle of independence up to certain extent and provides a out-of-the-box solution to solve inter-communication & storage challenges for microservice architecture. There are some internal grid implementations that operate like clouds (these were built as greenfield implementations), but I'd bet that you could count on the fingers of one finger the number that have done anything similar for more general purpose systems. Most large enterprises cannot even count how many servers they've got deployed, let alone what they're used for (if anything) or pay as you go. Insightful information shared. One can also get the list of top 20 architecture colleges in india only at SMMCA Nagpur. Thanks for posting.